So, what do we mean when we say the word “reps”? congresspeople who represent us—representatives in the House of Representatives and senators at the national level, in addition to our state representatives. Depending on the issue you want to focus on, though, it might also be more effective to call the executive branch, especially a specific cabinet department, or a hotline/company (but more on that later). Why do we call our reps? The whole point of our system of government is that politicians are supposed to honor what is important to their constituents. 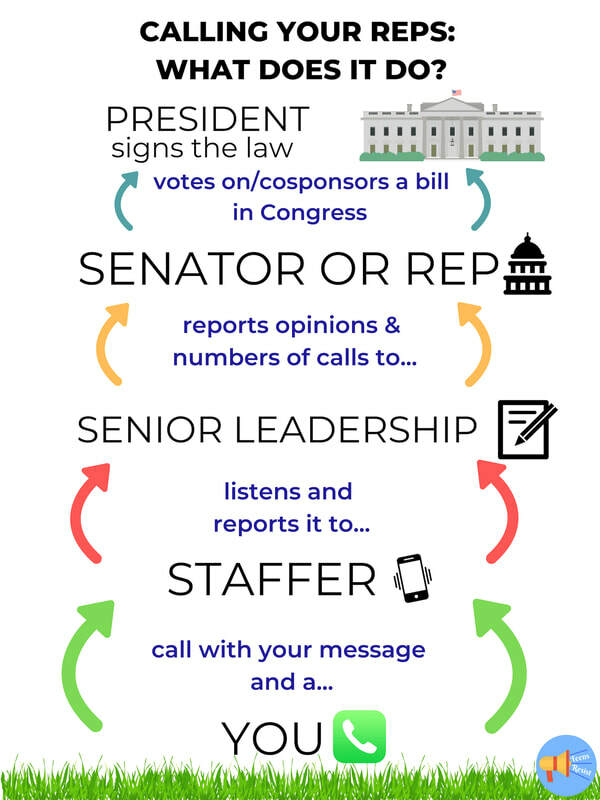 When you call your senator or congressperson, they gain more information on what is important to you, and your opinion influences the way they think about a particular policy/how far up on their list of priorities it is. How do you know who to call about an issue, and what phone number do you dial? Think about the issue: who has the most direct control over how it turns out? If you wanted to call to stop the construction of the Dakota Access Pipeline, for example, you might call the DAPL Hotline or the DOJ’s Environmental Division. Teens Resist includes who to call in each featured topic in a list, in case you want more examples/aren’t sure. The Capital switchboard numbers will connect you either with your US senators or your US representatives at 202-224-3121 after a few simple steps. If you want to get at the root of corporate power, you can consider calling or emailing a company. For example, the companies that fund the children’s detention centers at the border. We usually include these when applicable as well. For other phone numbers, Google is generally a great resource! What do you say once you get on the phone? 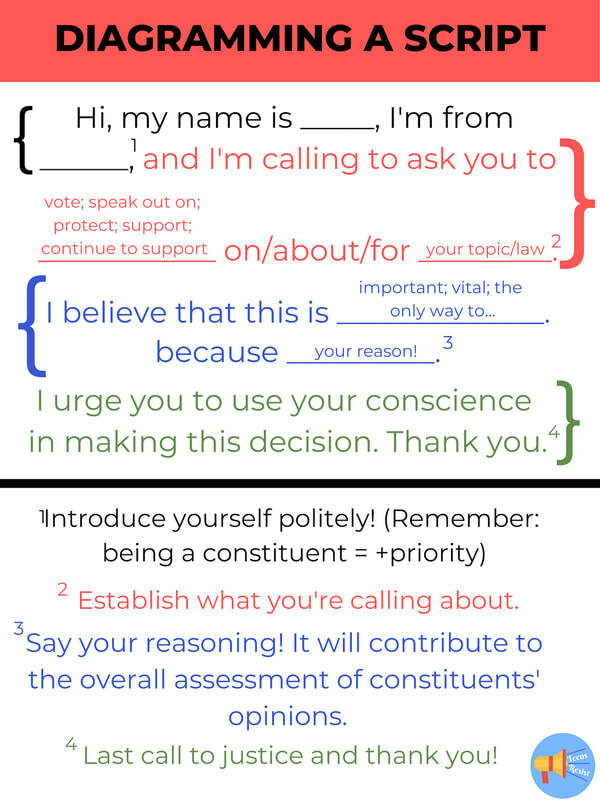 Hi, my name is ______, I’m from _____, and I'm calling to ask you to [ vote; speak out; protect; support; continue to _] on/about/for [ your topic/law] . I believe that this is [important; vital; the only way to _] because [your reason!]. I urge you to use your conscience in making your decisions on this topic. Thank you.